When you think of the American involvement in World War II you inevitably think first of the fighting across northern Europe after D-Day and the island-hopping Pacific War, but of course there was so much more to it than that. Despite two years of war in Europe, and several more in China, the United States was not well-prepared for war when Japan attacked Pearl Harbour on 7th December 1941, and consequently saw many of its possessions in the Pacific lost to the Japanese. The men that defended those islands have not previously been modelled in this hobby, so this set from Strelets fills a gap that has been there for a long time. From the point of view of the US, the opening months of the war were dominated by attacks from the Japanese as they defended the Philippines, Guam and so on, so all these figures are wearing tropical kit, namely shirts and trousers with boots and short gaiters which on some of the men look too short for the usual leggings they would actually have worn. That apart the uniform is properly done, with some men having rolled their sleeves up. The troops still wear the steel helmet first adopted in 1917 and basically copied from the British 'Brodie' helmet, which is fine too (the famous M1 with which they would be associated in this war was not introduced until 1942). The last figure in the third row is generally where we place any officer figures, but in this case the said figure has three inverted chevrons on his sleeves, marking him out as a mere sergeant rather than an officer. That being the case, it is very surprising that he is armed only with a pistol, and even more so that he is still wearing his Montana-peaked campaign hat rather than the steel helmet which, in reality, all the officers also wore. This is presumably another case of a manufacturer departing from the reality to make it abundantly clear that this is the officer, and while they have for some reason made this man just a sergeant, his stripes are easily removed or painted over to improve his rank! At this stage in America's war the most common weapon was the rifle, generally the Springfield M1903 or the M1 Garand, but which of these is being carried by these figures is impossible to say. Apart from the pistol there are three other weapons on display here; a Lewis gun, a couple of Thompsons and a BAR. The Lewis gun, another survivor from the Great War still in service, is being carried by the third man in the third row. Although they were sometimes fired from the hip we can be reasonably sure that this man is simply carrying it as there is no supporting sling and the magazine is pressed against his clothing, which would stop it rotating. The Thompson submachine guns are being used by the first figure in row two, and the second in row three, and both look the same, with no forward pistol grip, a straight magazine and no cooling fins on the barrel. All these were very new innovations for this weapon in 1941, so we would have much preferred at least one to have the pistol grip and the round drum magazine. While the newer design was in use by this time the earlier models were far more common and would have been a better choice in our view. In any case this weapon has been modelled rather too big here. Finally we have the BAR, or Browning Automatic Rifle, held by the first figure in the third row. Although commonly used as a light machine gun, here it is being fired from the shoulder, which was not so easy. The webbing of these men is fairly light, which is understandable as they would generally be serving very close to their centre of supply and would not need to carry more than their immediate requirements. The riflemen all have the standard M1923 cartridge belt, while the man with the BAR also has the correct pouches. The operator of the Lewis gun seems to have a single pouch for magazines attached to the back of his waist belt, which is very strange as the Americans always carried such ammunition in wooden boxes rather than this way. The two men with Thompsons both have appropriate ammunition pouches – the kneeling man has one on his right kidney, though here it is missing one of the five compartments, and the standing man has a pouch divided into three in the same place, plus a set of five at the rear. Generally the set of three held 30-round magazines and the five at the rear would have held 20-round ones, so he is particularly well endowed with ammunition. Most of the men have the standard canteen, and the man holding the grenade has a rectangular item which looks something like the pouch for wire-cutters, though it is clearly not attached directly to the belt and there is little reason why defenders of the Pacific Islands would carry such cutters anyway. Most also carry a blade, but whether it is a bayonet or a knife is impossible to say with Strelets sculpting, although even those with a weapon that cannot take a bayonet have one. The poses are fairly standard Strelets, and the advancing figures in the top row are the nicest. There are no outstanding poses though, and plenty of upright ones, although the vegetation of many Pacific Islands would make cover abundant and so perhaps less need to duck and run than on other battlefields. Nothing here is particularly unusable, although as on any 20th century battlefield, any man wearing no helmet and simply firing a pistol is going to have virtually no impact on the outcome of the fight. Having said that, at the time there were still horse-mounted US cavalry who would have looked more like this figure and certainly were armed with pistols. The sculpting is also fairly standard Strelets. Detail is adequate but not great on things like weaponry, and the faces are not good on some either. Weapons are generally more slender than some previous sets, but the knives/bayonets are still fat and stunted. The usual rough look is accompanied by a little flash, but not too bad. This is possibly a better than average sculpting effort from Strelets, but the fairly sophisticated nature of the subject highlights the deficiencies in a way that simple ancient subjects do not. 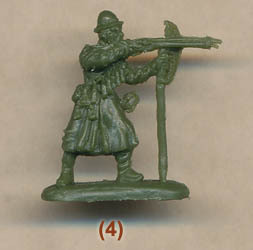 There is no ammo support for the man with the BAR or the Lewis gunner, which is a common weakness in such sets, and the sergeant/officer is both confused and not suitable for any real battlefield. Otherwise this is a set which does not look too good but is fairly accurate and finally delivers US troops for the testing years of 1941 and 1942.